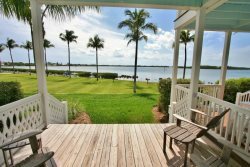 Spacious and charming End Unit Town Home featuring 3 Bedrooms and 2.5 Baths at one of Marathon Florida Keys most prestigious resorts, "Indigo Reef Resort Villas & Marina" ~ Magnificent views from this home with sought after close proximity to Indigo Reef's Pool. Step out of your Luxurious Master Suite and step into Indigo Reef's Paradise on your upper-level private balcony which features magnificent views of the Florida Keys Sunsets. The unit is laid out beautifully with views of the Gulf of Mexico and the Indigo Reef Resort Pool from your deck, fully equipped kitchen with lots of granite counter top space, elegant living room with plush leather sitting and large flat screen TV, Extra large dining area with table and a convenient lower level guest bath. On the second level, the Master Suite has a private Master Bathroom and the bedroom opens up onto the upper-level balcony. There are two more bedrooms on the second level plus an additional guest bathroom for convenience and a Washer and Dryer closet. In all of the Florida Keys, Indigo Reef Resort stands out as one of the most tasteful resorts that we have to offer. Indigo Reef Resort vacation rentals feature an amazing landscape characterized by native flora surrounding the entire complex which is laid out with the specific goal of 'Tropical Relaxation' in mind. The upgraded interior furnishings of this home are exquisite when compared to other homes at the resort. Docking - 31 feet of docking directly behind the pool is free with unit 36. YOU MAY NOT ENTER RESORT GROUNDS WITH TRAILER PLEASE PLAN your trailer parking in advance. Bedrooms/Accommodates (3/6) - The master suite features a king mattress and the other two bedrooms feature a queen mattress and two twins respectively. This home will sleep 6 people comfortably, however, we can accommodate 8 if approved by Coco Plum Vacation Rentals. Beach/View - This resort home features a remarkable view from both the upper and lower level decks, living room and Master Suite. Sombrero Beach is a ten-minute drive from the Resort and Coco Plum Beach is 5 minutes. As it has been in previous years, indigo reef surpasses all expectations! We have three little girls under 4 years old and they made the most out of the swimming pool! We stayed in The Spotted Eagle Ray for the second time and everything was just perfect! Our unit was clean, full of supplies and a real home away from home! The grounds are immaculate and the fellow residents are extremely friendly! We will be back again next year for stay number 4. It's always a pleasure staying with Coco Plum at Indigo Reef! Garbage collection Stations are located adjacent to carports. Your slip is limited to 31 feet overall length including pulpit and motors. If you are over 31 feet in overall length, it will be your responsibility seek arrangements and relocate your vessel to a marina. The slip is labeled Villa 36 and is located behind the pool.